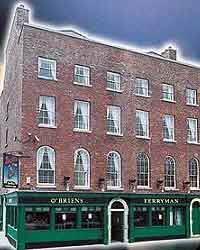 Built in the 1780s by Lord Cardiff, The Ferryman Hotel is steeped in history. Two listed Georgian buildings make up this hotel which is full of character, style and elegance. It takes its name from the fact that the ferry used to cross at this point transporting workers from the north to the south quays. Now as a modern hotel accommodation is provides beautifully decorated modern accommodation with many guests returning year after year. The hotel provides 22 comfortable and relaxing en suite rooms with all necessary facilities including television, direct dial telephones, ISDN lines and tea and coffee making facilities. Accommodation is above the lively Ferryman pub so bear this in mind! Being a listed building it was not possible to install an elevator, and may not be suitable for those who find climbing stairs difficult. Although most of the rooms have a double bed or two single beds, the hotel has a number of triple and quadruple rooms making it a suitable venue for parties of 15 to 20 people. Every effort will made by the friendly staff to accommodate all your needs. The Ferryman pub is a warm, vibrant and energetic pub offering lively entertainment in a traditional atmosphere. It is very popular especially with the under 40 age group and the older people who enjoy an energetic atmosphere. The Southbank Restaurant serves excellent meals prepared to the highest standards right throughout the day. The restaurant has an amazing view of the River Liffey. Ideally situated on Sir John Rogerson's Quay, overlooking the River Liffey and facing Dublin's International Financial Services Centre. This is the ideal location for people coming to Dublin to shop, explore, or attend business meetings. The city centre is just a fifteen minute walk away up the river's quays. And for sports fans the hotel is just minutes away from Lansdowne Road, Croke Park and Shelbourne Park and for concert lovers the Point Depot is just a short distance from the hotel.